Hasn’t it ever happened; that you suddenly stumble upon a website and before you proceed browsing any of its pages, you want to see if the hosting is a reliable one? This is most likely to happen to most people who know the insights of any website hosting. Sometimes it’s necessary if the website or service asks for your credit card details. Not all e-Commerce sites are familiar but yet we often need to make transactions over there, and if the web hosting is unsafe it could incur us with bigger penalties. Whatever may be the case, getting reports on website hosting is more of a requirement than a luxury. The website basically provides the insights of a website’s hosting. For example, if you need to spend some money on a new online commerce website, you need to know if the hosting service is reliable and the website is trustworthy. 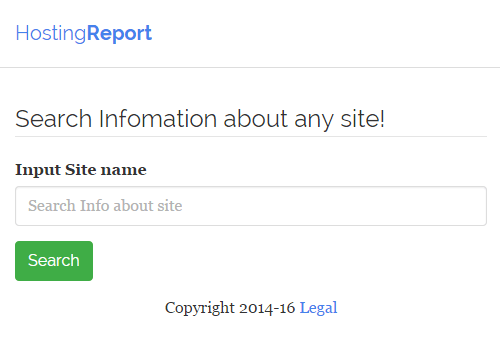 HostingReport.info goes through several criterions to judge the website’s current hereabouts and presents the information before the requester. Proper on-site SEO analyses like H1 & H2 tags, internal links and Meta description etc. We were impressed by the minimalistic standards on the landing page of HostigReport.info. The website is just a beginner, when they start providing the service in full brim we expect HostingReport.info to become a truly reliable hosting information seeking resource.